Over the Rainbow: Happy Birthday, Theresa! The talented and sweet Theresa is celebrating a birthday today, so we're having a little blog party for her! I got to know Theresa through blogging, and her comments always enlighten me and crack me up at the same time. I hope this is one FABULOUS birthday for you, my friend! The next stop on the blog hop is Lydia! And if you want to start at the beginning, check out the Scrapbookers Anonymous blog. Thanks for coming by and have a great Friday! And to feed my curiosity, what's the best birthday YOU'VE ever had? omgosh.. 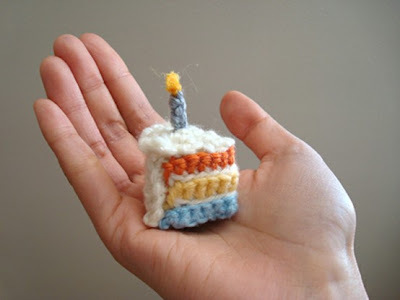 I love that super duper adorable birthday cake made of crochet. so darn cute. it made me smile. =) it is always a pleasure to come to your blog and see your fabulous creations. it's been a pleasure getting to know you.. the internet is a great place isn't it??? Thanks so much for the birthday wishes. it really made my day. The best bithday ever???? hmmm. every one i have is pretty awesome, but i don't think the blogger censors will allow me to give the details of mine... lol..